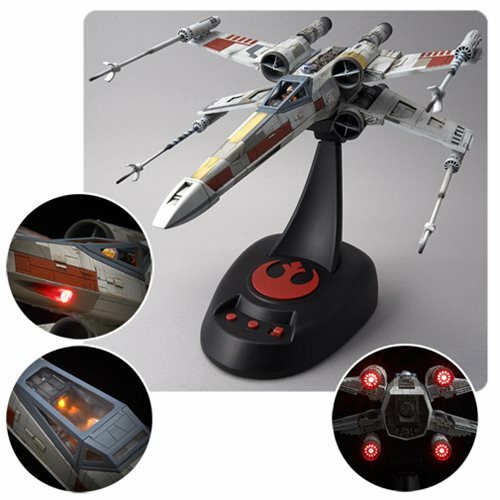 From Bandai Hobby comes this amazing Star Wars X-Wing Starfighter Moving Edition 1:48 Scale Model Kit! Reproduce Proton Torpedo attacks with fantastic lights and sound! The S-foils open and close by themselves and LEDs in the rear engine and cockpit light up for added realism! The kit includes original stand with effect switches, 8x Runners, 1x Foil sticker, 1x Water-slide decal sheet, and 1x Instruction manual. Requires 2x "AA", batteries not included. Measures about 10 1/5-inches tall.